I just saw the latest episode of The Amazing Race, and Moscow’s trolleys were featured prominently, along with its metro. And that’s when I remembered this post. Those trolleys do look nice! PS. You may remember me – we met during the SkyTrain OMC tour in early November. Like Eric, I was watching The Amazing Race last night and the detour involved the Moscow Metro and the Moscow trolley buses. In both cases, teams had to navigate via either the trolley bus network or the metro to complete the task. One team didn’t know what a trolley bus was and boarded a diesel bus – found out their mistake and had to go back and start again. 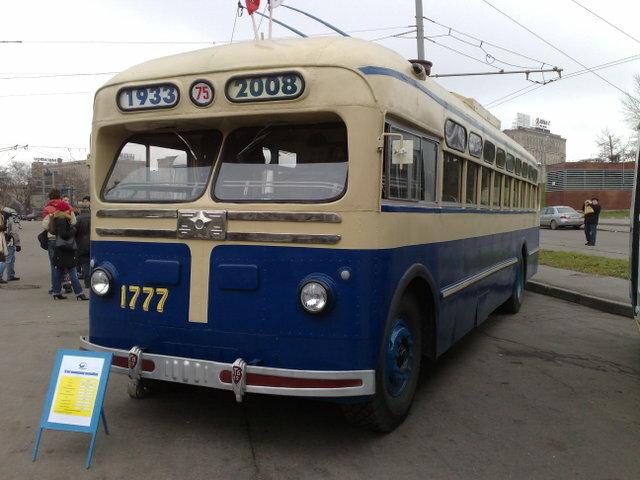 Of the four teams, three picked the trolley bus option. Hi Eric! Nice to hear from you again! And hi David! Thanks for the recap. Pretty awesome that the trolleys were all over the Amazing Race just after I posted this. I hear the Moscow Metro stations are really beautiful, too. One more system that would be great to visit in the future! 2008-75=1933 – this year more then 5 millions were starved to death (Holodomor recognized this year in Canada as an act of genocide) in USSR by hand made famine. So, this trolley at photo came from horrific time.